Generic Company Place Holder Chop Sushi! As the App Store becomes crowded with games, more companies come up with more unusual ideas to stick out from the crowd. Enter THQ Wireless and their $3 game Chop Sushi, which definitely sticks out. I am Master Chef, here to battle your inner demons ... with sushi! You take the role of Master Chef, a pink piece of sushi with legs, who must do battle against the personal demons of the depressed people he encounters on the numerous islands he swims to. ‘Battle’ means creating match-threes using different types of items that will eventually cause enough damage to the enemy to destroy him. Match-threes are created by picking up items with chop sticks and moving them to the end of the row or column via the flick maneuver. As simple as that might seem, the game is actually quite complex. Each move must create a match three. Don’t worry if the board has no match three possibilities…the stones on the board will crack open, revealing more items to match. Master Chef can match Wasabi, directly damaging opponents, or create recipes with sushi, fish, and fugu, triggering powerups and traps. You can even play the standalone challenges you purchase along the way, which require completing the match-threes in a certain number of moves. The graphics remind one of Americanized anime clones, but images of items during battles are crisp and clear despite the tiny sizes. A varied soundtrack of music completes the game. 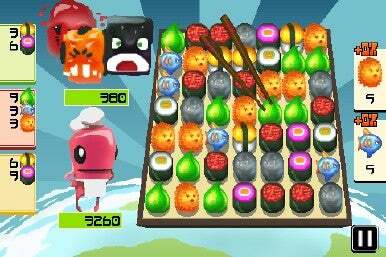 Chop Sushi is a puzzle game that requires a lot of tactical thinking during play, and a large number of hours to complete. For $3, you’ll definitely get your money’s worth, and no bad sushi to boot!